Our small, high-throughput Dip Probe is ideal for laboratories. 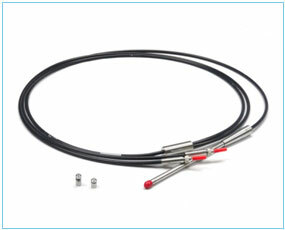 Economical and durable, the Dip Probe is available in fixed path lengths of 2, 5, 10, and 20 mm, and comes with a screwable SMA connector for interchanging tips on the same set of optical fibers. The optical fiber is 400-micron core-fused silica and is clad in PVC-coated stainless steel armor for longer life. These probes come with the option for Teflon® sealing for high-temperature operation and can be customized for both UV and NIR versions. Compatible with all our spectrographs, the fiber optic dip probe is ideal for customized manufacturing applications.